At a book event at BooksActually two weeks ago, I was making a point about Roy Ngerng—that what he insinuated about Singapore’s prime minister was clearly wrong, but I still sympathised with his predicament—when Jen Wei Ting, moderator, good friend and fellow scribbler, interjected and switched topics. Wei Ting had perhaps wanted to cut me off before I said anything too critical about Roy. She needn’t have worried. Roy and I met after the event and he told me he had enjoyed the talk. I regret not taking a photo with Singapore’s latest enfant teribble; just for the heck of it, not that he needs any further attention. What a meek, innocuous figure he cuts. With his disarming smile and diffident touch, he looks hardly capable of harming an ant, much less the great and mighty Lee Hsien Loong. Roy’s appearance and demeanour may seem irrelevant here, but in what is quickly turning into a PR disaster for the government, they will fuel the perception of an irascible prime minister bullying a harmless, hapless citizen. My heart goes out to you, Oh Roy, not for your defiance, but for the deep-seated informational, data and communication asymmetries and imbalances that underpin this country’s drastically unequal social power structure. Dear friends, thanks for all the support and encouragement. It’s still a bit surreal holding my very first book in my hands. In some ways, it seems like just yesterday that Sumana Rajarethnam, my best friend, and I were telling people that we wanted to cycle around Malaysia on RM10/day, and most responded that we’re nuts. But the anguish and self-doubt we went through then also seems very far away when I look at the book. Now, it seems almost self-evident that we would end up with something. “It always seems impossible until it’s done,” as Mr Mandela says. Not that writing one book is that big of a deal…but it was a mountain for us. I thought I’d just share a few thoughts about the actual launch itself because the day was both exhilarating and harrowing. I will try my best to tell this story without it becoming a bit of a Sandiwara. Not easy, given the details you’ll read, but I’ll try. I returned home on Tuesday morning from a 10-day trip abroad–a holiday my mum had planned in January, well before I knew about the dates for the book launch. I was in pretty good shape, went to work, and then returned home in the evening, looking forward to preparing my notes and slide deck for the launch on Wed evening. When I returned home, I found out that my dad had been admitted to hospital. Nothing too serious, he had been down with flu on the last day of our holiday. But still cause for a little bit of concern. Given that he wasn’t too ill–“just observation”–the main disappointment here was that he would not be able to attend the launch the next day. Soon after, I found out that my uncle in KL had just passed away. I wouldn’t say I was super close to my dad’s cousin, but neither were we far–I always had a good laugh with him whenever we met, and often sung songs together. Regardless, these double shocks meant that despite being quite tired from the trip and the whole day at work, I just wasn’t able to sleep. I slept for 3 hours, and then woke up at 2am, and couldn’t get back to sleep. From 2-7, I was just lying in bed, a million thoughts racing through my head. “Should I postpone the event? Should I go to KL for the wake? Should I visit my dad in the morning?” etc. etc. The most immediate problem, of course, is that I had a Channel News Asia interview scheduled at 8.20am. Up till about 7.15am, I thought I might cancel it. But I was also worried about the repercussions, especially after the planning the CNA production team had done–reading the book, writing up questions for the anchors, etc. If I cancelled, would CNA ever call me back? How bad would it look for the book if I wasn’t there? How many people would I be letting down? So, I got up showered, chugged two big mugs of green tea, and headed over to Caldecott. It seems like only a few people who knew me well could tell I was tired, so overall, not too bad. You can watch the interview here. The next problem is that I had to go to work, but I could hardly sit up after the Live TV energy-boost had worn off. So, at around 9.30am, I spoke with my boss and applied for urgent leave. Always understanding, she told me to take it. I worked for about an hour, some urgent emails and calls, and then collapsed in bed. I woke at around 2pm feeling fantastic. From that point on, the day was a breeze, actually. Sumana, my wife and I headed down to the Esplanade at around 5.45pm. The folks there were setting up, so we just hung around waiting. The next few hours passed by so quickly. Before I knew it, some guests had arrived and were asking for the books and my signature. From then on, I was moving around, saying hello, signing books, getting dragged back into the studio and asked to “relax and prepare”. I didn’t really need to, because I am quite comfortable speaking in public. In fact, people around often have the opposite problem–getting me to shut up. Many people asked me how I was feeling. I said great, but that I had had a real moment of crisis and panic in the morning. Before I could explain why, I was whisked off somewhere. It was all a lot of fun, but also quite chaotic. The diversity of the crowd was wonderful. On the one hand, there were people who have known me since I was in diapers, and friends who had been there right from the start–they had bade farewell to Sumana and me in 2004, as we cycled off. I felt so happy that they were there to witness the end of the long journey. On the other hand, there were quite a few new friends–people I had just met, some others who I was meeting for the first time, people who have followed my blog writings and had come down to support me. I was humbled. One of my big disappointments of the night was the organisation. There were long queues of people waiting to get into the Studio, waiting to buy the book, waiting to get my signature. I don’t think this is necessarily anybody’s fault, but just a confluence of factors. The Esplanade is extremely stringent about all sorts of things. All guests must have a ticket before they enter. We are allowed to issue only 245 tickets (the capacity of the Studio). Guests are allowed in only after 730pm. etc etc. 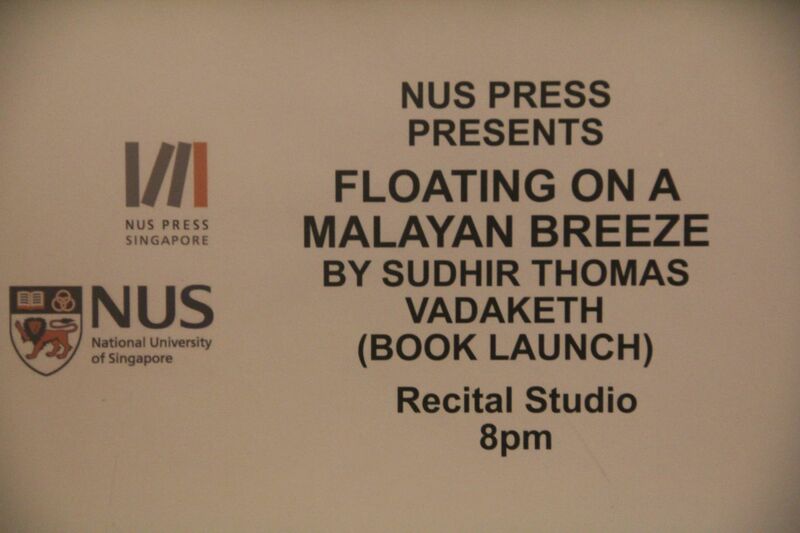 On top of that, my publisher, NUS Press, was also a bit under-resourced for an event like this. I know they were all trying their best, but many guests entered the Studio feeling tired and frustrated after what must have seemed like an unnecessarily laborious entry process. As the author, I felt quite bad. Note to other artists/authors: The Esplanade, while a lovely venue with a great location, has soooo many regulations and rules. It would take me an hour to list them all, but here is one: no outside mineral water bottles allowed because of product placement rules. What did this mean for us? Well, Christine from NUS Press had brought 3 bottles of Evian water and placed it next to the panellists chairs. Before the event started, an employee from The Esplanade went around removing the labels from around the bottles. No big deal, but just another activity in the rush to set up. If you’re interested, The Esplanade has its own water–of course–that you are welcome to buy and use there. Nevertheless, strict rules and guidelines can be the bedrock of efficiency. Another good thing about The Esplanade is that everybody there is very professional and competent, and their systems seem to be working perfectly. So, once the guests had finally sat down and the proceedings were underway, everything went off flawlessly. The rest of the evening went by in a blur. First Mr Nathan made a speech that had been largely written by Sumana. Then I spoke for about 20mins. 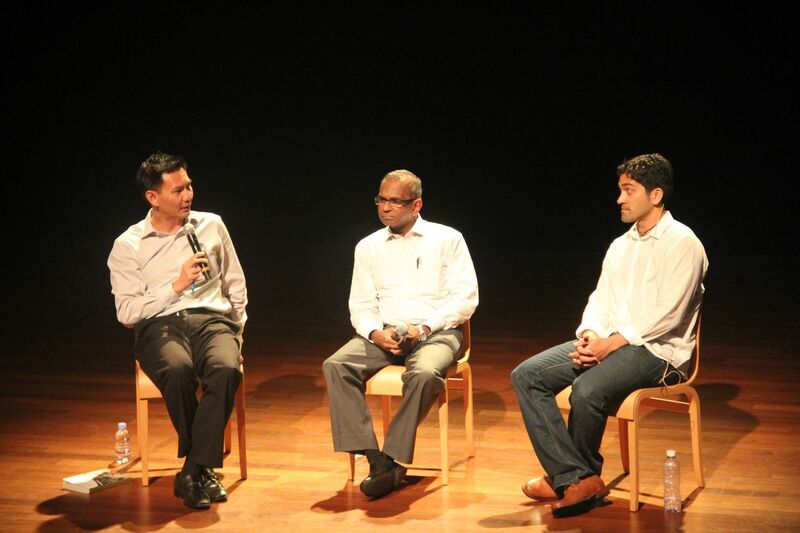 Then Donald Low, Manu Bhaskaran and myself had a panel discussion, with lots of audience participation. (For those who are wondering why and how I asked Mr Nathan, Donald and Manu to join me, please read this other piece, The politics of personalities.) Then everything was over and I was outside signing books. And then, finally, I was downstairs at Sauce, having drinks with friends and family. By that point, the stress of the early morning seemed so, so far away. It was quite thrilling, really, to be celebrating with friends, new and old. A good friend bought me a Flaming Lamborghini, something I hadn’t had for a long time. As the bartender lit the drink up, he said, “This will help you float on a Malayan breeze.” It did. In a way, all this is a bit anti-climatic, because I had actually finished with the manuscript in April, and for the past month have actually been thinking a lot about my next project. That said, it still feels quite good to know that an 8-year project has finally come to an end. This is the longest piece of work I’ve been involved in. At many points I felt like giving up. When I started it, I was single, still in college, and wondering what I was going to do with my life. Now, by the time I’ve finished, I’m married to my darling wife, working in a job I like, and….still sort of wondering what I am going to do with my life. Now that it’s all over, I actually feel a bit of a void. 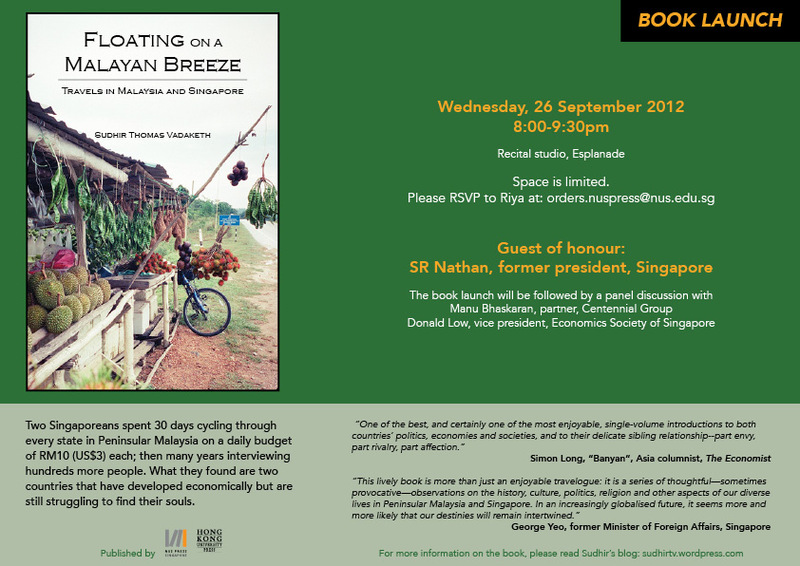 Dear friends, some of you have asked me how and why I asked George Yeo to write a review for the book, SR Nathan to be the guest-of-honour at the launch, Donald Low and Manu Bhaskaran to join me on a panel, etc. There was actually a lot of thought put into all this by the publishers–the Hong Kong University (HKU) Press and the National University of Singapore (NUS) Press–and myself. And at the end of the day, we are all absolutely delighted with the kind words and support we received from these distinguished people. Let me start with the reviewers of the book. We had initially wanted to get three reviewers–one foreigner, one Singaporean, and one Malaysian. The first person I approached was Simon Long. Simon is a very senior journalist at The Economist. He was the Asia editor when we first met, and commissioned my very first few pieces for the newspaper. Today he is “Banyan”, writing our paper’s Asia column. Simon readily agreed, much to my delight. While it was great to have Simon’s review on the book, we knew we couldn’t just have “one white guy”. 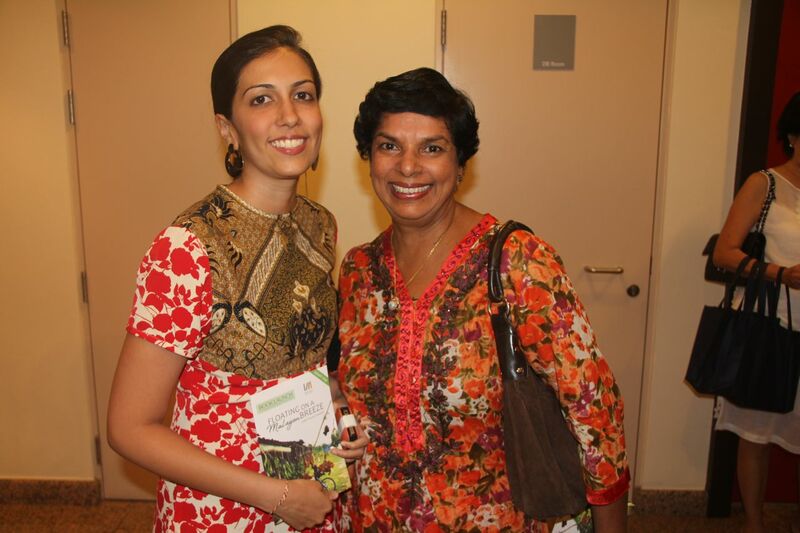 We didn’t want the book to be perceived as some Western, neo-colonial interpretation of Malaysia/Singapore. So I was thrilled when George Yeo agreed. Mr Yeo is probably the politician in Singapore with the broadest appeal across the political divide. He is also highly respected the world over, both regionally and internationally. Finally, we wanted to get one Malaysian to write a review. Given the occasional animosity between Malaysia and Singapore, we don’t want the book to be perceived in Malaysia as an ivory tower, Singapore-centric view of the region. I have spent a tremendous amount of time on the ground in Malaysia, interviewing hundreds of people, but that hard research could be undermined by negative perceptions. However, the problem is that Malaysia currently faces the worst ideological divide in the country’s history. According to everybody I spoke with, every prominent Malaysian has stuck his/her flag on one side of the political divide. 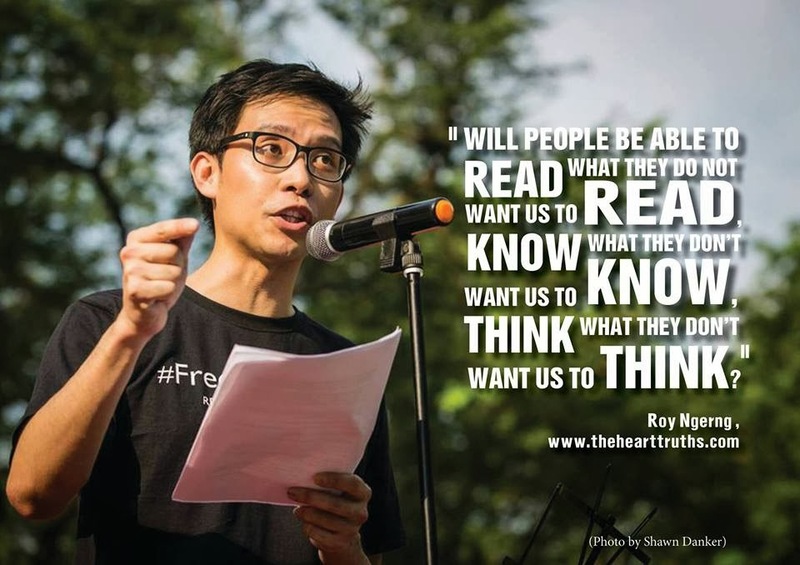 There is no famous person with appeal akin to George Yeo in Singapore. And so–we made the decision not to have any Malaysian reviewer on the back. In our assessment, the risk of being seen as aligned with one side or another was higher than the risk of being seen as a Singapore-centric narrative. I hope I don’t come to regret this. (You can read the final reviews here). For the launch itself, the first two names almost wrote themselves: Donald Low and Manu Bhaskaran, who have become good friends and inspirations over the past few years. We’ve spent a fair bit of time shooting the breeze, talking politics over beers, so I was confident our rapport would make for a good session. However, after chatting with a few people, I realised that I also wanted to invite somebody a bit closer to the establishment. Donald, Manu and I will probably all be regarded as non-establishment (not necessarily “anti”, but just “non”). 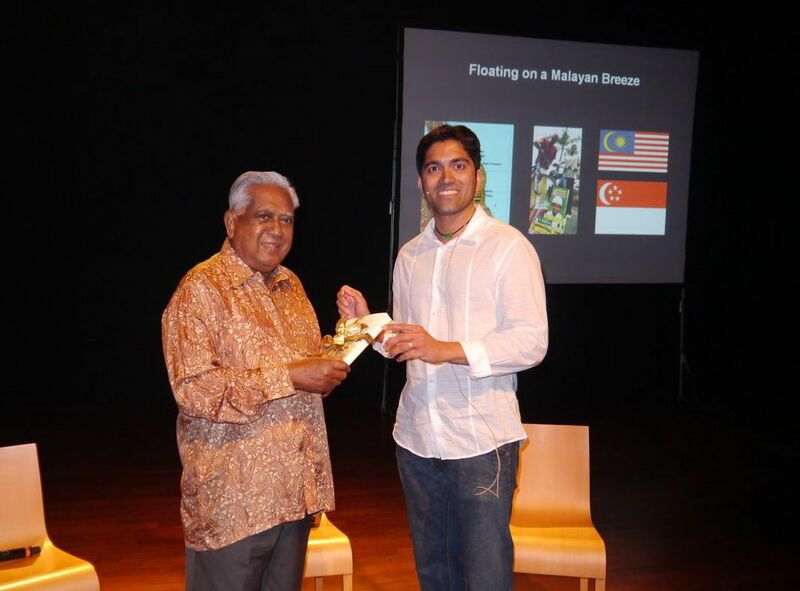 And so I was absolutely chuffed when Manu invited SR Nathan on my behalf, and he accepted. 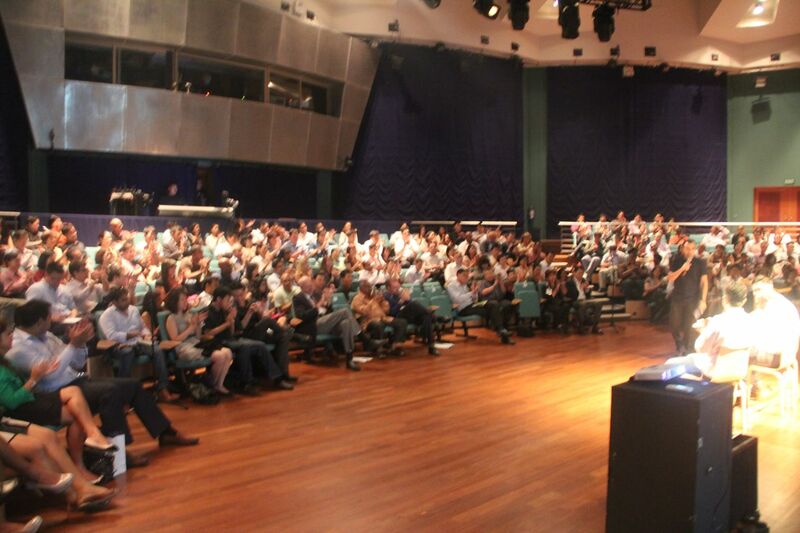 There were several people who questioned the choice of Mr Nathan as guest-of-honour. I think they have an aversion to anybody perceived as close to the PAP; they would have rather just had Donald, Manu and myself speaking about my book. But that would have been a slightly narrow field, given the similarities in our socio-political views. My feeling is that it is best to always have as broad and inclusive a conversation as possible. That means involving people from different points of our political spectrum: non-establishment, and establishment. As with my writing, I hope that any events I organise and participate in will always be balanced and reasoned. Most importantly, this will make my writing appeal to as wide an audience as possible, which is what I hope for from an intellectual point of view–and, no doubt, it’s what makes good commercial sense too (that said, one might argue that partisan channels and viewpoints, not moderate middle-of-the-road ones, are currently more successful in some democracies such as the US). On his way out, Mr Nathan just jokingly scolded me about one thing: he didn’t like my portrayal of the Communist Party of Malaya (CPM). He felt I was a bit too sympathetic towards them. He says he wants to have a word someday. I look forward to it.